We planned on getting up early and trying out Granola, a breakfast place Sarah suggested, but I suppose we were still catching up on sleep. We got up with enough time to check out of our hotel, store our luggage, and test out another coffee shop (much better than our stop yesterday) before spending a few hours in the Nationalmuseet or the National Museum. Suman wanted to see its Viking collection. While there was some, mostly items found in a sacrificial bog, there wasn’t as much as she had hoped, so we decided to look at the coin exhibit. The museum’s strange layout made it somewhat challenging to find. We had to weave through each numbered room and into a stairwell where we found a door that said the coin exhibit was closed. While we saw some other cool stuff, mostly religious, we decided we weren’t going to go on the goose chase for the toy exhibit. Instead we returned to the hotel, retrieved our luggage, and after a short time in the lobby, we got a taxi to the boat, operated by Windstar. Windstar’s flagship boat, Wind Surf, is small compared to most cruise lines. It holds 310 guests and 191 crew. It has five masts and seven sails. It can travel at 10-12 knots under engine power and up to 15 knots with the help of the sails. Our large room (bigger than our hotel room) was at sea level on deck one. The main deck was the fourth level and the fifth and sixth deck were the only other decks with a few group activities though most the action was on the fourth floor. It took us a little while to figure out the layout, but it was important to note that getting fore and aft on the boat can only be completed on the inside on the main deck. Otherwise, we had to walk outside in the rain, not so much fun. 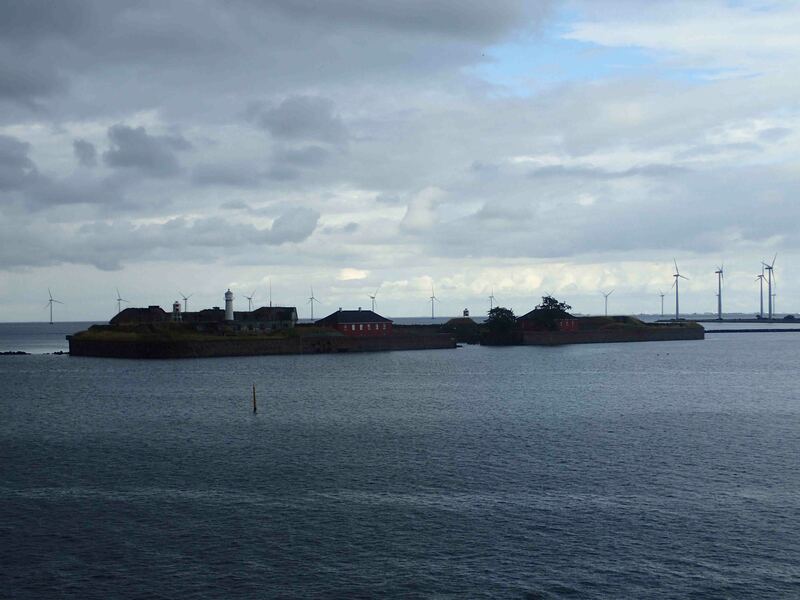 We had a light lunch on the veranda, made reservations for a few dinners in different restaurants, and soon waived good-bye to Copenhagen as we set off to sea with dramatic music in a downpour on our Baltic Sea Cruise.